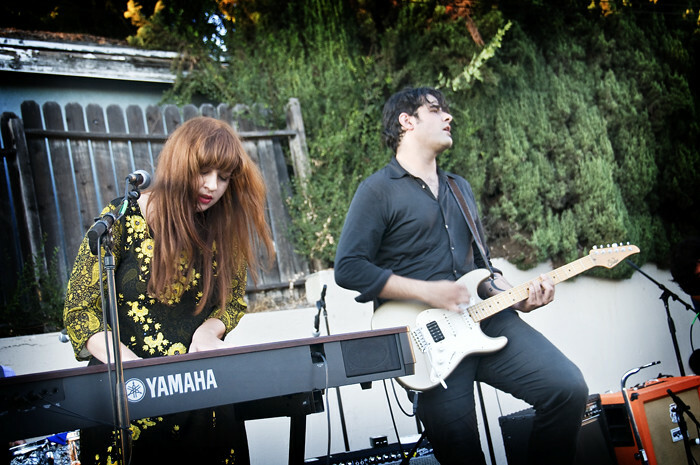 Here’s the part about a few of the female fronted bands that recently played at 13th Annual Eagle Rock Music Festival. 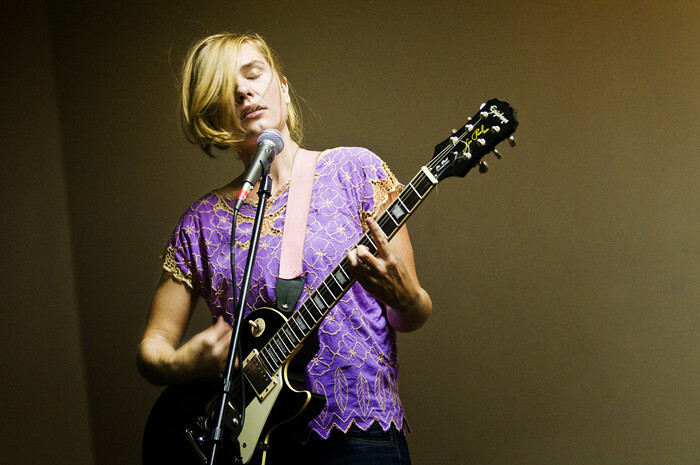 There was Little Red Lung lead by the vocals and keys of Zoe-Ruth Erwin. They performed early at 6pm, while the sun still shined bright with heat. There is something about listening to somber echoes in the daytime that does not have as much of a moody effect as echoes in the night or under shadows of candle light. Daytime is not a mood enhancer for music, it always seems, unless it is raining, and it was not raining. The violin of Charlene Huang cried soft and sorrow, but again, did not have an eerie effect as it likely would have during a night show. The sun shining on the creeping lullabies of Little Red Lung was too bright for the listener to be absorbed into their thick red and heavy gasping darkness. Saucy Monky performs at Columbo's Restaurant during the 13th Annual Eagle Rock Music Festival. Outside of Colombo’s Restaurant was Saucy Monky. Cynthia Catania and Annmarie Cullen share vocals. Catania is sultry roughness while Cullen exudes a softer shy tenderness. Together they give audiences a feeling of kicking up dirt and washing it down with American bourbon. A sort of pop and Country grinded between the cracked concrete of city streets. There’s an unsmooth rawness that gives their sound an undoubting vitality of hope scraped with scars. Most people probably missed their performance because they had to compete with a jam band playing on the balcony of the apartments across the street, or also, because they played at Colombo’s Restaurant behind a mesh fence that concealed them almost to their necks, while onlookers watched in the streets, leaning on a police car. It was as if they were poking their heads over the fence to sing. What the heck happened there? 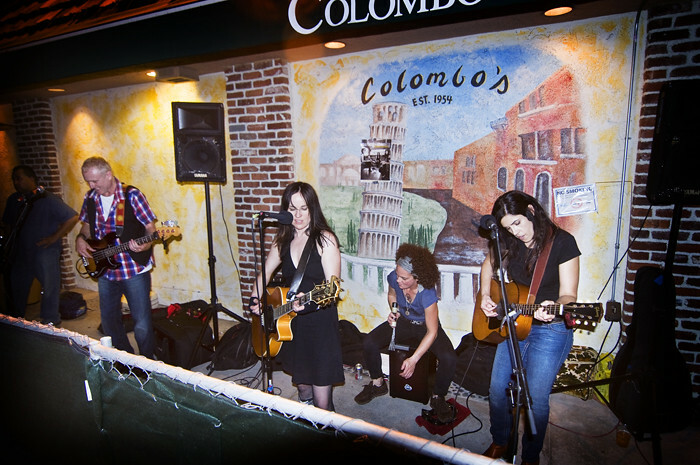 While in the backyard patio of Colombo’s was an audience of chairs for an elderly cover band. It would have been better if Saucy Monky simply played on the streets. The bad staging area probably had to do with some screwy city ordinance thing. 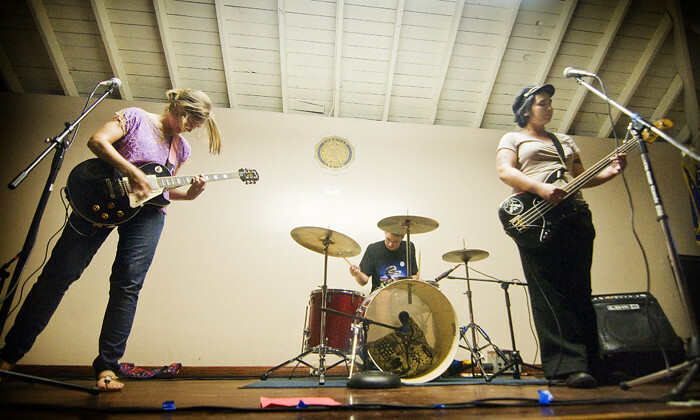 Cheeto Champ performed at the Razorcake/Zacaloc stage in the American Legion Hall during the 13th Annual Eagle Rock Music Festival.